All good things must come to an end. Yes, I am talking about this month long exploration into the fantastic world of Marathi Cuisine. My sincere thanks to my friend, Shalaka, who helped me out every step of the alphabet..er.. way. For the last letter of the English alphabet, Z, here is an authentic Maharashtrian Zunka. The phrase or the combo Zunka-Bhakri is a very famous and dear to many communities. But unfortunately I am out of time to make bhakri for this time, so just enjoy the Zunka while I am off composing the Recap of this series to be posted a couple of days. I am sorry that this post is a few hours late. The hard disk of my computer crashed and so I am still in a state of shock. I am frantically looking for the backup disk and trying to figure out if the data can be recovered and checking to see when the last backup was. Luckily the pictures for this post were still in my camera and so using my daughter's laptop to publish this post. Hopefully all the data can be recovered and I learn my lesson :). In a heated pan, add mustard seeds. After they crackle, add cumin seeds. Add the grated ginger and garlic and sauted for a few seconds. Toss in the chopped onions and saute until they turn a shade of golden brown. Sprinkle salt, turmeric and red chili powder. Mix well and gradually add the sieved gram flour while constantly mixing. Roast the gram flour for a couple minutes making sure no lumps are formed. Slowly sprinkle 2-3 tablespoons of water each time until the whole mixture is just moist. Stir the whole mixture well with a strong ladle making sure there are no uncooked lumps of flour. Sprinkle more water if the mixture dries up. The idea is to keep the mixture moist but not watery. I used about a cup of water in 4-5 installments, so to say. Cover, reduce the heat and let it steam cook for 4-5 minutes. Remove the lid, mix well and remove from fire. Garnish with chopped coriander leaves and serve with Bhakri or Roti. For the penultimate day of this Mega Marathon, I had to use an adjective to get through this though letter - Y. But the Vadi or Burfi is an addictive one. The burfi has the unmistakable flavor of chikoo (or Sapota as we call it) and makes a delightful dessert to share. My friend asked her mom to share the exact recipe, but apparently she works with a voluntary organization where they prepare this Vadi and sell commercially. So her mom said she cannot divulge the proprietary recipe. That was when my friend searched multiple recipes and gave me this formula as she felt it was close to what her mom makes. Later when I shared this Vadi with her, she was happy to have suggested this recipe :). Recipe Source - Referred lot of sources on Youtube but this method was certified as more authentic by my friend. Thaw the frozen chikoo and mash with a spoon. In a non stick wok/kadai/pan, add the ghee and the mashed chikoo. Add in the coconut too and saute for 3-4 minutes. Add the khoya, sugar and crushed almonds. Keep stirring as it tends to burn very easily. Stir until it comes together as a single mass. Grease a tray and pour the mixture onto it and flatten it with a greased spatula. Sprinkle the chopped cashews and press them in gently. Let it cool for a few minutes. Slice into desired shapes and enjoy. If you are wondering what's with the name of this simple Coconut Laddu, then you have missed a lot of action this month over in our BM group. The BMers are travelling alphabetically through cuisines and I have chosen to explore the Maharastrian cuisine. I understand that coconut forms a very integral part of the coastal maharastrian cuisine and so I thought it apt to showcase this ultra addictive, super easy and quick to make laddus. Heat a non stick pan, pour the condensed milk, coconut powder, milk powder and mix them. Keep stirring making sure it doesn't get burnt. Also make sure the heat is on low to medium. Stir for about 4-5 minutes until it comes together as a solid mass. Remove from heat. While still warm, grease the palms of your hands, pinch a small lime sized portion of the mixture, shape into a smooth ball, roll in the extra coconut powder set aside for the purpose and set aside. Continue for the remaining mixture and serve in (decorative) cup cake liners for a mess free experience. They can be refrigerated and need to be consumed in a couple days or so. As we are getting closer to the end of the English Alphabet, we get to deal with the tough letters. Luckily for the letter W, the choice was easy. This Red Pumpkin Sweet Puri is apparently known as Wada in the local vernacular. So Wada it is for today. It is mildly sweet and was well liked by my family. A recap of the series.. In a pan, heat ghee and saute the grated pumpkin taking care not to let the pumpkin brown. Meanwhile, melt the jaggery with a few drops of water, strain for impurities and pour the molten jaggery into the red pumpkin mixture. On low flame, stir it until well incorporated. Remove from fire. Add the mixture to wheat flour and salt. Knead into a stiff dough while the mixture is still warm to touch. Heat oil in a wok/kadai. Gently slide the disc and fry on both sides until they are golden brown. Fry them on low to medium heat as they tend to brown easily. Drain excess oil onto paper towels and continue the frying process for the rest of the dough. Enjoy the mildly sweet puris as is for a delicious snack. To continue the series of the Maharastrian cuisine, here is another farali recipe, as it is called. Farali means food suitable for fasting. As I mentioned yesterday that is certain communities, there is a certain regimen followed during the fasting days. The regimen includes certain food restrictions and methods of cooking too, sometimes. Varai in Marathi means little millet or Sawa millet or Sama / Moryaio. So this is a lightly flavored dish which needs an accompaniment suitable for fasting, like the Shendanyachi Amti or Upasachi Batata Bhaji. Wash the little millet and drain. Keep aside. In a heavy bottomed pan, heat ghee. Add in the cumin seeds, cloves, bay leaf and cinnamon. Add in the washed and drained little millet. Saute until the little millet changes color a little. Add salt as needed and pour boiling water into the little millet. Cook for a few minutes. After the water is all absorbed, cover and reduce the heat to simmer for about 4-5 minutes. Check if the grains are cooked through and remove from heat. Serve it Shendanyachi Amti for a fasting feast. The last week of this Mega marathon will see us navigate through some tough letters. For those of you who joined the series late, I am part of a Blogging Marathon group. 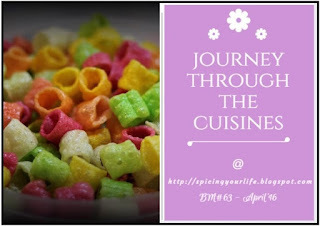 And we as a group are doing this series called Journey Through The Cuisine. I am exploring the Maharashtrian cuisine alphabetically one letter each day. Today the letter U was easy as the word Upvas (meaning fasting) can be prefixed to some special dishes which are aten mostly during the fasting days. For us in Andhra Pradesh/Telangana, there is nothing specific called fasting food. Whereas in some regions, when they say fasting it only means they will eat only certain types of foods of the seed variety like Amaranth(Rajgira), Singhada (Water chestnut), Sago and vegetables like Pumpkin, Potato etc. This version of potato sabji qualifies as a Farali dish or a sabji suitable for fasting days. In a heated pan, add ghee and cumin seeds. After the cumin seeds crackle, add the boiled potatoes. Sprinkle the crushed peanuts, green chili paste, grated coconut, salt and sugar. Add a few spoons of water, mix well, cover and let it cook for 3-4 minutes. Remove from heat. Serve it with Yogurt and/or Rajgira Roti. For the letter T, I picked a perfect condiment to accompany pakodas, samosa or any type of chaat like Pani puri, Samosa Chaat, Ragada Pattice and the like. I used it in the Matki Usal which I served as chaat. The addition of sev in the chutney was very new to me and I guess I can attribute the smooth texture to it as well. Pulse together all the ingredients adding as little water as possible until it becomes a fine paste. Adjust the flavors and store in an air tight container in the refrigerator for up to 2 weeks. In the 'Journey Through the Cuisines', I have come to the next letter in the alphabetical order, S. I found innumerable options for this letter but chose to go with this simple and hearty gravy. Since there are potatoes in this gravy it was a super hit with folks at home. Boil the potatoes and set aside. Make a smooth paste of peanuts and green chili adding about half cup of water. In a heated pan, add ghee and the rest of the seasoning. Pour the peanut paste along with some more water and let it come to a rolling boil. Add in the tamarind extract, salt and jaggery and add in the boiled potatoes. Let the mixture thicken a little and remove from fire. [Keep in mind that the Amti thickens as it cools].